Axons are long, threadlike extensions of nerve cells that transmit electric and chemical signals to one another. Professor Yishi Jin's research at the University of California San Diego (UCSD) Department of Biological Sciences, focuses on regenerating axons, especially regeneration following injuries thought to be irreversible such as spinal cord damage and stroke. On the hunt for genes involved in regenerating these critical nerve fibers, biologists at UCSD were surprised to discover a new genetic pathway that carries hope for victims of traumatic injury. According to Jin, although no cures exist for these injuries, if damaged neurons do not die "there is hope to find ways to make them stronger and help them regrow." Assistant Project Scientist Kyung Won Kim, Professor Yishi Jin and their colleagues genetically screened the roundworm C. elegans looking for genes that might limit nerve regrowth. Unexpectedly, they found that the PIWI-interacting small RNA (piRNA) pathway — long believed restricted to function only in germline (egg and sperm) cells — plays an active role in neuron regeneration. The discovery is published online Jan. 25, 2018 in the journal Neuron. "This came as a total surprise. piRNA wasn't anywhere on our radar. But now, we are convinced it is a new pathway that functions in neurons and, with some work, could offer therapeutic targets for helping neurons do better against injury." Yishi Jin PhD, Chair, Section of Neurobiology, Division of Biological Sciences, Department of Cellular and Molecular Medicine, UCSD School of Medicine, La Jolla, California, USA. Jin and Kim explain that piRNA was historically viewed as a defense mechanism for germ cells against transposable elements, with no role in the nervous system. After identification in their genetic screening, the researchers went on to study piRNA's role in axon injuries through experiments using a femtosecond laser instrument, which emits ultrafast pulses to allow precise cuts in axons. When Kim first presented her data implicating piRNA in restricting axon growth, Jin said the results seemed improbable. Eventually the results proved irrefutable, especially when the researchers knocked out a fleet of genes necessary for piRNA production and found that a damaged roundworm axon regrew better. "For us this finding is totally unexpected. We are now investigating detailed mechanisms that regulate the pathway inhibiting axon regeneration, including identifying specifically which piRNA elements are involved and how they function in axon regrowth." Kyung Won Kim PhD, Assistant Project Scientist, Department	Neurobiology, UCSD School of Medicine, La Jolla, California, USA. The PIWI-interacting RNA (piRNA) pathway has long been thought to function solely in the germline, but evidence for its functions in somatic cells is emerging. Here we report an unexpected role for the piRNA pathway in Caenorhabditis elegans sensory axon regeneration after injury. Loss of function in a subset of components of the piRNA pathway results in enhanced axon regrowth. Two essential piRNA factors, PRDE-1 and PRG-1/PIWI, inhibit axon regeneration in a gonad-independent and cellautonomous manner. By smFISH analysis we find that prde-1 transcripts are present in neurons, as well as germ cells. The piRNA pathway inhibits axon regrowth independent of nuclear transcriptional silencing but dependent on the slicer domain of PRG-1/PIWI, suggesting that post-transcriptional gene silencing is involved. Our results reveal the neuronal piRNA pathway as a novel intrinsic repressor of axon regeneration. Authors: Kyung Won Kim, Ngang Heok Tang, Matthew G. Andrusiak, Zilu Wu, Andrew D. Chisholm, and Yishi Jin. 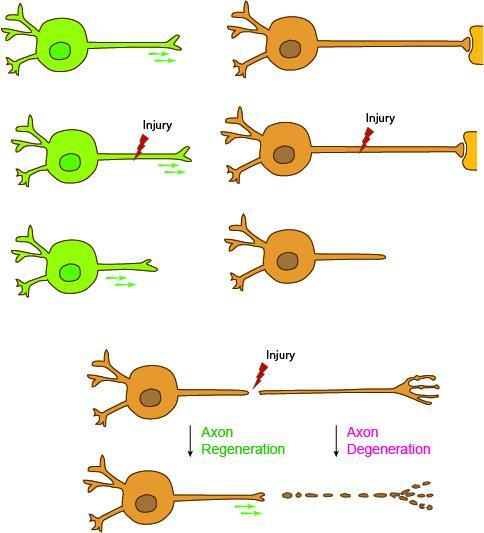 Axon regeneration after injury. Image credit: University of California San Diego.